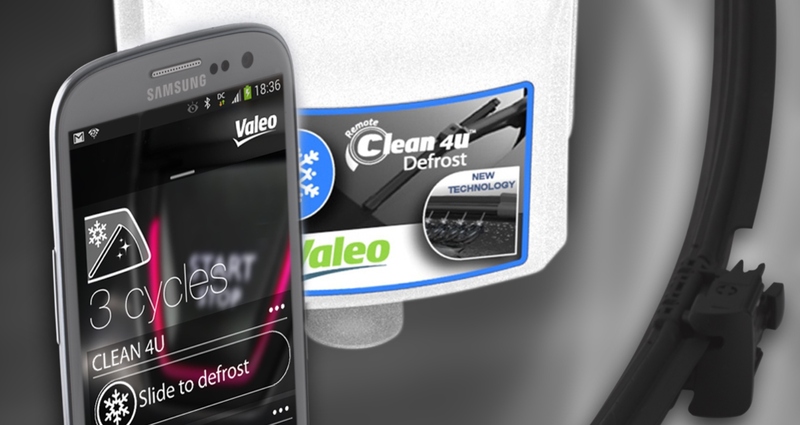 Valeo’s Clean4U™ is a revolutionary remote windshield defrosting and cleaning system that is controlled via a Smartphone application. Clean4U™ embeds two innovative functions: Defrosting, which automatically defrosts a windshield, engine off, in less than 90 seconds and Debugging, which washes away insects stuck to the windshield in less than 3 minutes. Based on Valeo’s AquaBlade® windshield wiper technology, Clean4U™ distributes through the blades an environmentally friendly defrosting or cleaning fluid. Remote Clean4U™ stuns at Frankfurt Motor Show!